Publishers Libros del Zorzal & Planeta explaining why they made a new translation for Argentina. Publisher: Editorial Abril, Buenos Aires, Argentina. 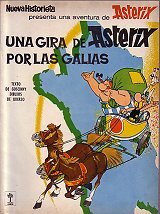 A separate Spanish edition for South America was published in the 1970's. Until 2015 the same Spanish edition was used in Spain and South America. Note that the translation of "tour de gaulle"  is called "una gira por las galias". This is not the name used for the spanish edition: "la vuelta a la galia"
Estamos en el año 50 antes de Cristo. Toda la Galia está ocupada por los romanos... ?Toda? !No! Una aldea poblada por irreductibles galos resiste todavía al invasor. Y la vida no es fácil para las guarniciones de legionarios romanos de los campamentos fortificados de Babaórum, Acuárium, Laudánum y Petibónum. The first story  was serialized in a 16 page booklet that was included in the Siete Dias magazine around september 1973, and in the magazine Anteojito, a few months before La Hoz de Oro. Although it was in four parts, we include it for completeness. Titles provided by Fabio, Marco Antonio Checa Funcke and Gus. Since 2015 a new Spanish series for South America is issued by Zorzal & Planeta. Map text provided by Huub.